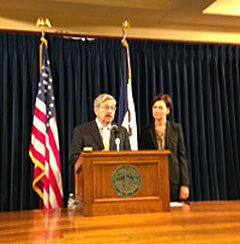 Governor Branstad, Lt. Govenor Reynolds. The SUV in which Branstad was riding was clocked speeding 19 miles above the interstate speed limit in April and the governor said in July troopers needed to obey traffic laws. However, it was recently revealed the governor’s SUV was stopped again for speeding, in late August. The trooper driving Branstad in August was pulled over near Hampton, but was issued a warning rather than a ticket because he was driving within 10 miles an hour over the posted speed limit. The trooper driving Branstad in April did not get pulled over, but later received a $181 ticket for speeding. Two of the Democrats running for governor have suggested there is a “pattern of behavior” which indicates Branstad has asked his security detail to speed. Branstad told reporters this morning he is only “aware” of two instances in which his vehicle has been speeding. Ousted Iowa Department of Public Safety Commission Brian London says the governor’s office ordered a check of a federal database and discovered at least 20 occasions when a law enforcement officer called dispatchers to check the plates of the governor’s vehicle. Branstad said federal law prevents him from releasing those details to Iowans. “I can tell you the Department of PUblic Safety should have informed us when we requested this information that this information was not public and we were not entitled ot it,” Branstad told reporters today. AUDIO of today’s news conference. The first campaign ad Democratic gubernatorial candidate Jack Hatch ran this summer focused on the governor’s April speeding incident, featuring music from the “Smokey and the Bandit” movie.